When I learned I could bring a guest with me on my West Wing and Oval Office Tour, I knew right away who to ask: my dad. An invitation to visit the White House enabled me to share a once-in-a-lifetime experience with my ever generous, American history buff dad. Why was I invited for a West Wing and Oval Office tour? 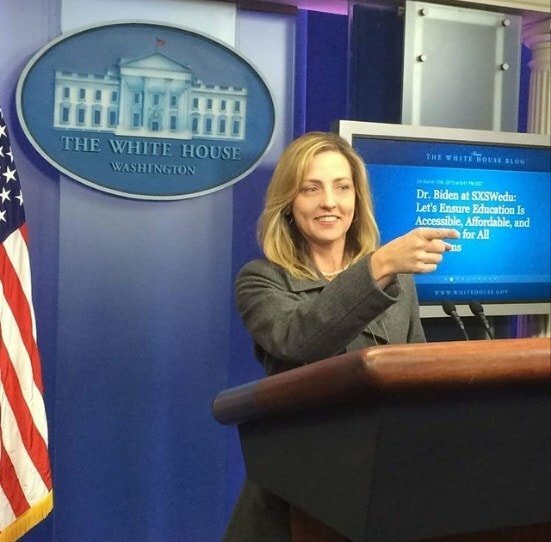 Back in December, along with 99 other popular travel bloggers, I attended a White House Travel Blogger Summit on Study Abroad and Global Exchange. As part of that event, I got a chance to tour the lower level of the East Wing of the White House. Following the summit, a handful of the bloggers were invited to return to the White House, this time for a tour of the West Wing and Oval Office. This group of 10 was selected for having the most influence in spreading the word about the importance of study abroad and global exchange. I was one of the lucky 10! Our tour guide was Fran Holuba, who does Global Engagement for the National Security Council and the White House. At the summit, Fran was all business and elegance. On this tour, things were much chummier and less formal. “Oh, yes, excuse me, I’ve worked here too long. Vice President Biden’s office is down that hallway,” she said. 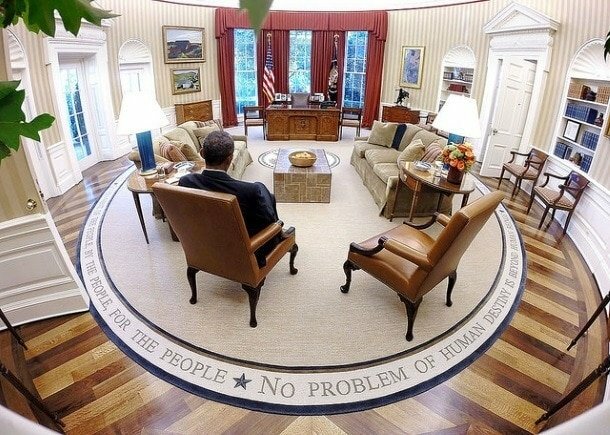 Finally, it was time for our ultimate prize – the Oval Office tour. We were disappointed that we could not actually step into the famous room or take photos, but we did lean over the security rope and peer all about. 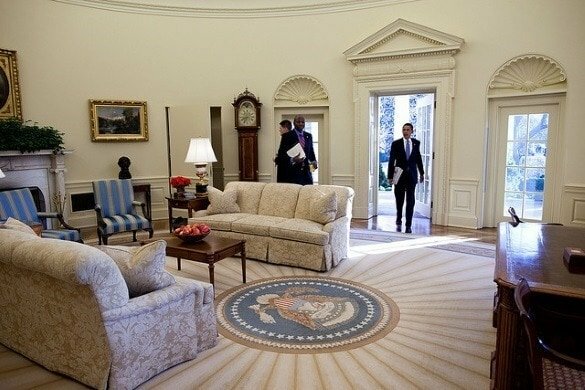 The Oval Office is surprisingly smaller than you’d imagine, but impressive in terms of its history and import nonetheless. The West Wing as a whole was less ostentatious than you’d expect. It’s clear that this place is for work, not frilly tea parties or extravagant balls. 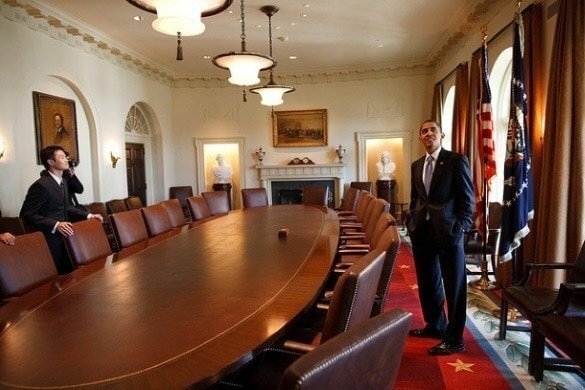 When President Barack Obama took office in 2009 in the midst of a recession, he did not do a major redecoration of the Oval Office as most incoming presidents do. He kept most of the decor of his predecessor, George W. Bush, until August of 2010 when Obama had the office restyled to better align with his taste. 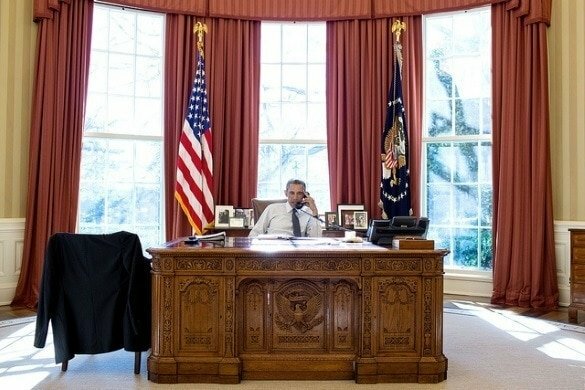 Both Obama and Bush used the Resolute Desk, a gift from Queen Victoria to President Rutherford B. Hayes, which was made from the wood from a British ship named the Resolute. Franklin Roosevelt had a door built to cover desk’s gap so people could not see his leg braces. Since then the desk has been used by John F. Kennedy, Jimmy Carter, Ronald Reagan and Bill Clinton, in addition to our two most recent presidents. While the President does indeed conduct business inside the Oval Office, he also has working desks behind those tricky doors that blend in with the wall paper. The updated version of the Oval Office appears more casual and welcoming with cushy sofas and paintings of American landscapes. On display behind the Resolute Desk sits framed photos of the President’s wife, Michelle, and his two daughters, Malia and Sasha. Other touches added since his presidency include busts of Dr. Martin Luther King, Jr. and President Abraham Lincoln. Obama is the first president to borrow items from the National Museum of American History’s patent collection to display in the Oval Office. These include models for Samuel Morse’s 1849 telegraph register, John Peer’s 1874 gear-cutting machine and Henry Williams’ 1877 feathering paddlewheel for steamboats. Fran pointed out how items were made in various U.S. states, from lamps to couches and other furnishings. The only one that stuck in my mind was the coffee table, because it was made in my current home state of Arizona. 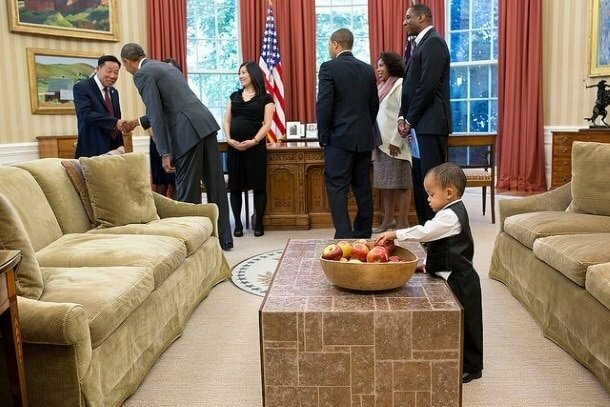 In every White House photo I could find of that coffee table, a large bowl of fresh apples was ever present. This seems a fitting nod to the First Lady’s healthy living initiative. Our tour ended with a visit to the James S. Brady Press Briefing Room, which again, surprised us with its small size and lack of pomp and circumstance. Journalists and cameramen have placed toys and other doo-dads on a shelf above the television cameras. Despite a sign instructing visitors to steer clear of the podium, my dad and I took turns playing President of the United States on the small, unassuming stage (with Fran’s permission, of course). This room is nicknamed the Press Pool because it sits atop a now drained swimming pool, which was originally installed for President Franklin Roosevelt as a therapy pool. It’s rumored that JFK took his mistresses, like Marilyn Monroe, swimming in the pool as well. My dad and I toured the Supreme Court, the Library of Congress, the United States Botanic Garden, and the National Portrait Gallery. With his knowledge of American history and politics, it was like exploring DC with my own personal guide. After three short days together, it felt a little bittersweet to return home. When again will I have an opportunity to spend quality time one-on-one like this with my dad? The best part of this trip to Washington DC wasn’t getting to peer into the Oval Office or stand at the President’s podium in the Press Room. It was watching my dad do these things. It reminded me of taking my kids to Disneyland when they were young children as they stared up with wonder and joy at Mickey Mouse. 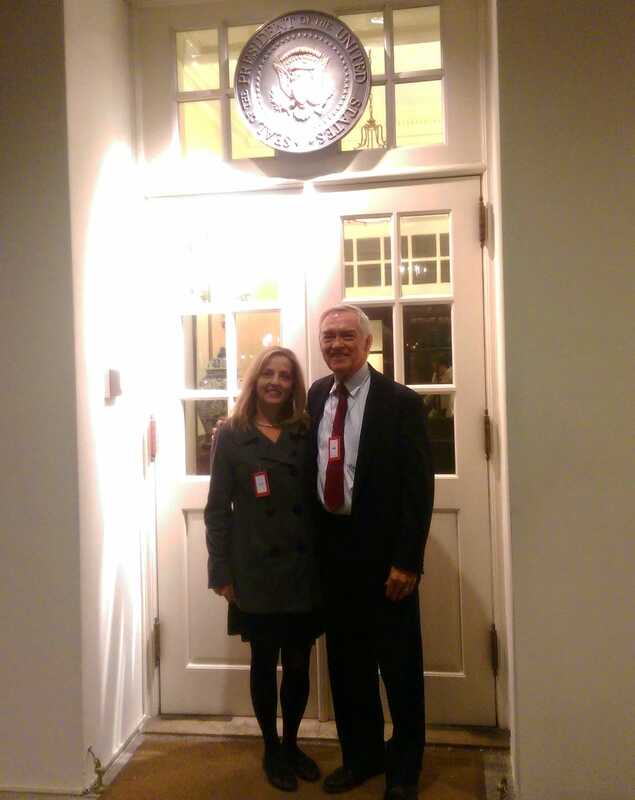 I can’t think of anyone who would appreciate, or who deserves, a West Wing and Oval Office tour more than my dad. My father has done so much for me throughout my lifetime. He played hours of go fish and double solitaire with me as a kid, relenting to my pleas for just one more match. My dad taught me how to throw a softball, and I often asked him to play catch in our grassy Midwestern front yard just so I could spend time with him. He spurred my love of horses by taking me on my first-ever horseback trail ride, and later cheered me on when I competed at horse shows. He also ignited my love of travel via family vacations to destinations near and far. My dad put up with me during my rebellious teen years, staying up late many nights on the couch to make sure I made it home safely. He paid for my undergraduate college education (including a year abroad in France) and footed the bill for my San Diego bay front wedding. A former CEO for a publicly held company and current business consultant, he has provided me with hours of resume editing, interview practices, business counseling and blog post editing over the years. Finally, I got a chance to give him something too. If you could go on a vacation anywhere in the world with your dad, where would you go? Let us know in the comments below! Beautifully written. What a wonderful opportunity. Your Dad totally looks like a candidate! I think getting access to the press room and being able to pose for pics like that is the very best part. Super interesting. I wonder if they let Canadians in? Hi Jody – I was on the tour with two Australian bloggers, so I’m sure they’d let Canadians too. You just need a different color security badge! What a special experience to share with your dad! Those kind of family memories are the reason I love travel. I want to go into the white house and have dinner with George Bush Sr. This is my dream. I wish I can make this happen someday. That’s quite the bucket list wish, Maedamile! I so desperately want to visit the West Wing! Excellent description of the tour. One day! One Day! I would love to create a story for my children’s books. 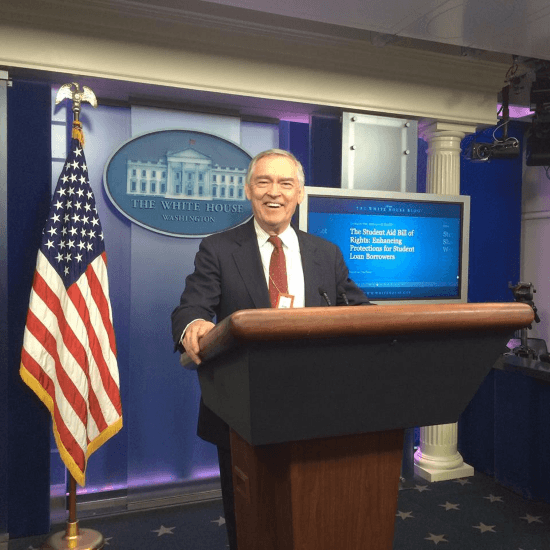 L. McGregor – I hope your dream to visit the West Wing comes true someday! I’m going to the West Wing Tour this Sunday! I’m super excited! Shelley – How exciting! I hope you enjoy your West Wing tour as much as my dad and I did. It really does feel surreal to be in the places where so many important world decisions have been made. BTW, such great memory you created with you Dad! Hi Barbara – I’m pretty sure you need to know someone at the White House to get a West Wing tour. For a regular tour, check the White House website and apply there. Enjoy DC with your grandson!